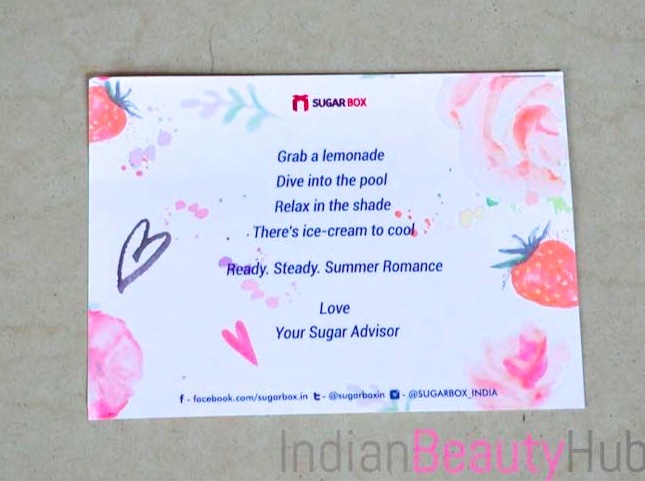 Hey everyone, today I’m going to share the contents of the ‘Sugarbox Summer Romance Edition‘ box that was sent to me for review by the Sugarbox team. Sugarbox is a monthly subscription box that offers fashion, beauty, lifestyle and gourmet products. Unlike the beauty boxes FabBag, MSM Box, and My Envy Box, the Sugarbox has much more to offer in addition to the skincare & makeup products. Every month Sugarbox team curates theme based boxes so that you can choose according to your liking. Currently, they are offering following boxes – Couch Picnic box, Summer Romance box and also mini boxes – Travel Quirk, Pout Perfect, Gold Rush and AU Natural Edition box. Click to know more about the Sugarbox. About Sugar Box: Sugarbox is a curated box full of exclusive goodies which are hand picked by the team of in-house stylists and epicureans. By subscribing to Sugarbox, you will receive the latest international offerings in fashion, beauty, lifestyle and gourmet products at your doorstep, every month. Not to mention the first bragging rights that come with it. Four subscription options are available – monthly, 3 months, 6 months and yearly. Click here to book your Sugar Box. 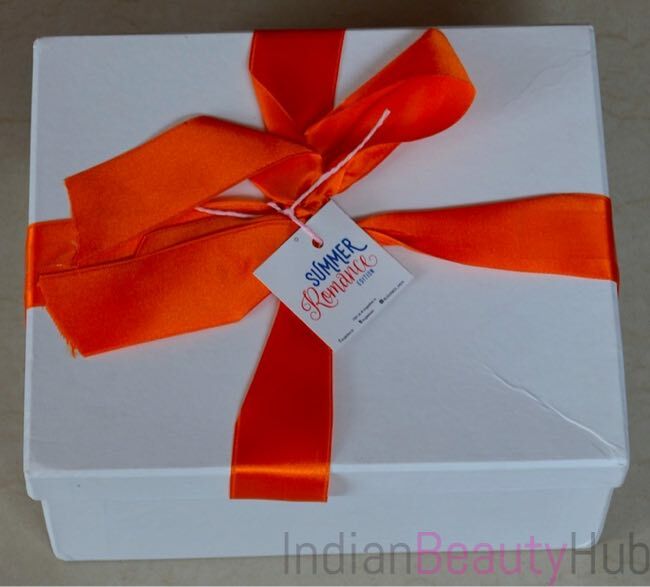 All the products come inside a sturdy white box and that orange ribbon adds cuteness to the whole packaging. The Summer Romance Edition box contains 7 full-size products – a tote bag, a beautiful red top, a rose headband, a hand charm, summer drink, hat and a face wash. 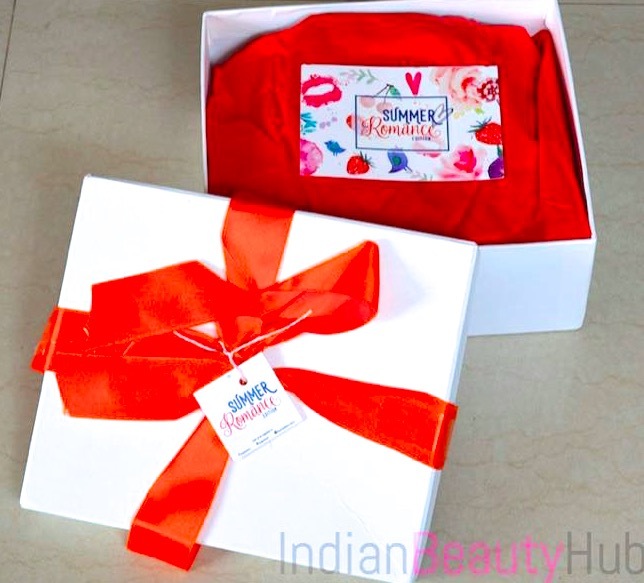 The price of the Sugarbox Summer Romance Edition is Rs.1899 where you get products worth Rs.4025. 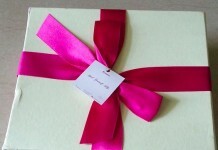 So what are you waiting for book your Sugarbox here. Given below are the contents of the Sugarbox Summer Romance Edition. Rose gold Headband: This is my most favorite item from this month’s Sugarbox. This head piece will look great with any kind of dressing. The golden accessory can go with almost every color and what else to say gold is my Favorite color :) You can use this piece as a headband or as a choker neck-piece. 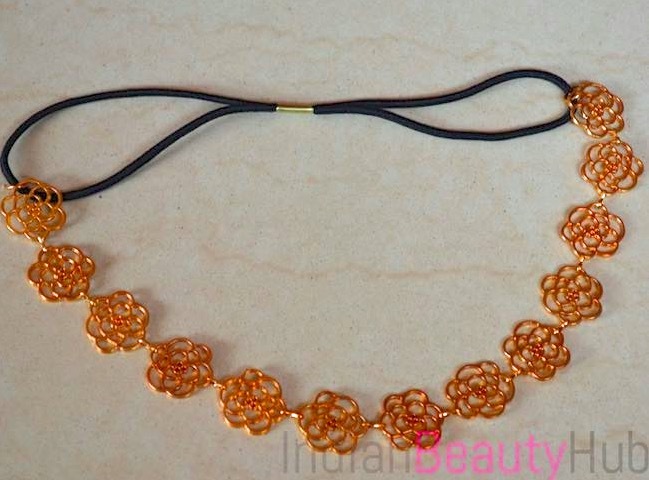 The price of the Rose gold headband is Rs.350. Tang Juice Mix: I have not tried this flavour of the energy drink yet. It looks quite refreshing, I think I’m going to like this tropical cocktail in this hot and lethargic weather. 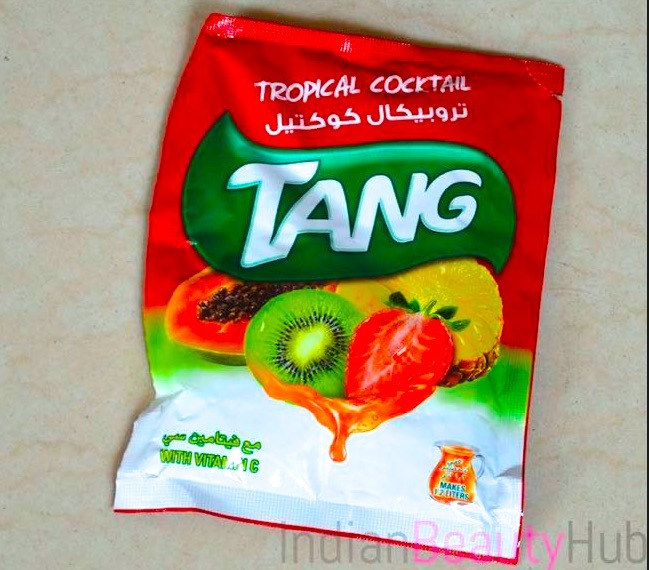 The price of the Tang Juice Mix is Rs.125. Chic fedora hat: Another must have for summers. If you are planning holidays in summers then a good hat is a must to have. This hat is made from breathable fabric that will keep your head cool during the hot weather. It will save your face from the harsh sun and also add a bit of glam to your entire look. 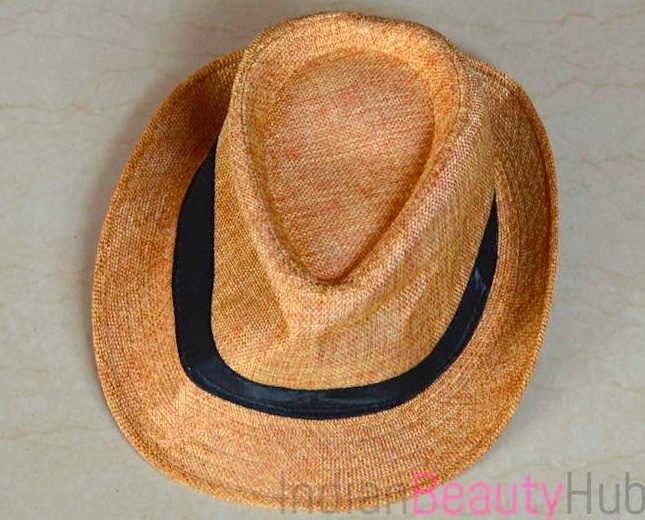 The price of the Chic fedora hat is Rs.550. Charming charm bracelets: I quite like this pretty charm bracelet. Again its golden color can go with any type of dress. The price of the Charming charm bracelets is Rs.650. 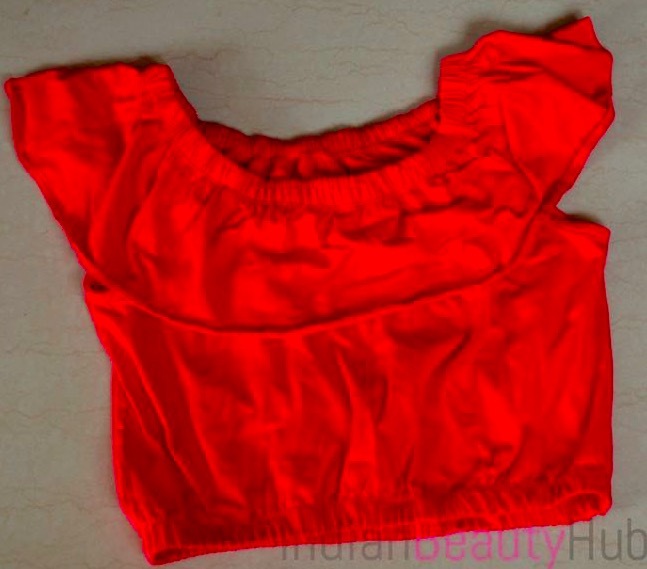 Offshoulder ruffle top: I got an off shoulder top in a reddish coral color. The fabric of this top is very soft & breathable. It is very comfortable to wear and the ruffle design adds style & elegance to this top. Though I’m not a fan of off shoulder clothing, am planning to give it to one of my cousin. The price of the Off shoulder ruffle top is Rs.650. Gold Chain tote bag: The box contains a beige tote bag with gold accents. This bag is very spacious and you can easily carry your most essentials while traveling. It is sturdy and simple yet classy design will compliment western as well as ethnic wear. This is my 2nd favorite product from this month’s box. 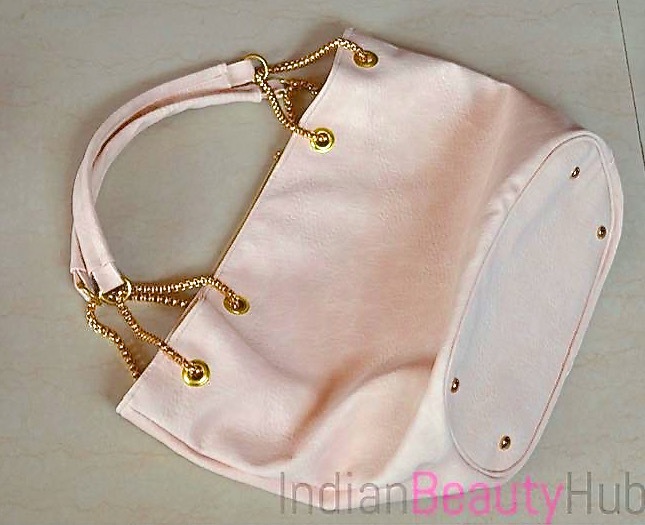 The price of the Gold Chain tote bag is Rs.1450. 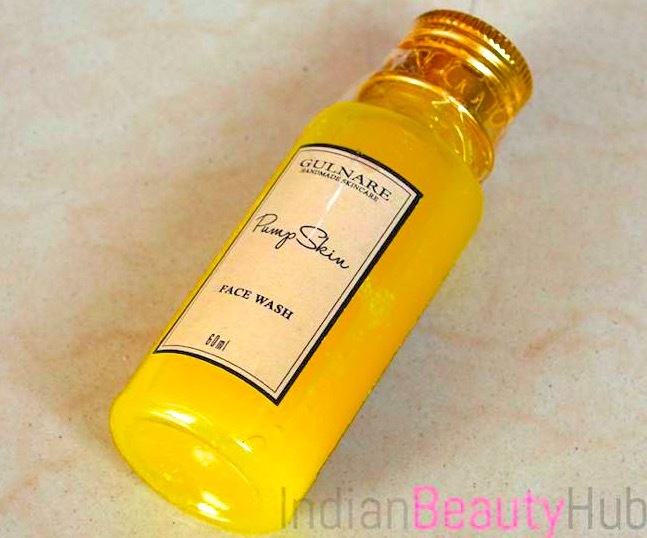 Gulnare Pumpskin face wash: Gulnare is an Indian beauty brand that is known for their handmade skincare products. I have not tried any Gulnare products in the past so I’m pretty excited to try this natural face cleanser. The box contains the 60ml bottle that will easily last for up to 2 months. The price of the Gulnare Pumpskin face wash is Rs.250 for 60ml. Overall I really liked Sugarbox Summer Romance Edition. It contains most of the products that you need while holidays in the summers. Though I wish they could have included some sun protection lotion or cream instead of that off shoulder top as everyone have their liking & disliking when it comes to dressing. I think everyone might not be comfortable wearing off shoulder dress (it's my personal opinion btw). But still I think it is worth buying Sugarbox as you will get some awesome stuff other than beauty at a very reasonable price. Also, you have so many options (boxes) to choose from. Recommended! I got worst products and placed a return and replace request. They have collected the faulty pieces but I am still waiting for the fresh products after 2 months of time. How can they do this to any customer. They only provide good products to blogger. Devanshi zaveri so true… I made a mistake of buying a subscription from them. They have no customer service no., Email and not even their address is mentioned on their website. I am still awaiting my November box 2018. They provided me with a fake awb no. Ibh why are you promoting these people… And luring new customers into their scam?? ?